Don Hankins is a professor of geography and planning at Chico State and a Miwkoʔ (Plains Miwok) traditional cultural practitioner. He has spent his academic career working on water and fire issues in California, with a focus on applied traditional Indigenous stewardship. You've done work on the use of Indigenous traditional knowledge related to fire and water. A major result of your research and practice has been to reveal a disconnect between current environmental management and Indigenous approaches to working with the environment. Can you say more about what you have found? Tribal knowledge and experience are often marginalized or devalued in environmental management, and relationships between managers and Tribes are often non-reciprocal. For example, when it comes to fire, there can be a sense that Indigenous knowledge is a relic of the past. This is not the case – Indigenous fire practice is alive and well. It brought us through the major climate events of the past and is absolutely relevant to the challenges we face today. Integrating Indigenous knowledge and people into ongoing management efforts can preserve traditional ways and invigorate agency approaches, but my own research has shown it can also subjugate Indigenous perspectives. For example, there is a great deal of resistance regarding how traditional cultural burning can be carried out in partnership with agency-based programs. 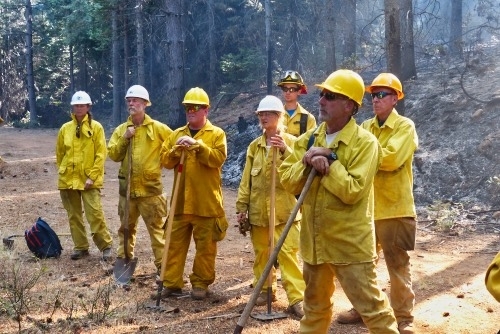 Rather than recognize the knowledge and preparation that traditional cultural practitioners have, agencies see their standards-based approach as the only path to putting fire on the ground. This in turn risks traditional knowledge of fire and related cultural practices. 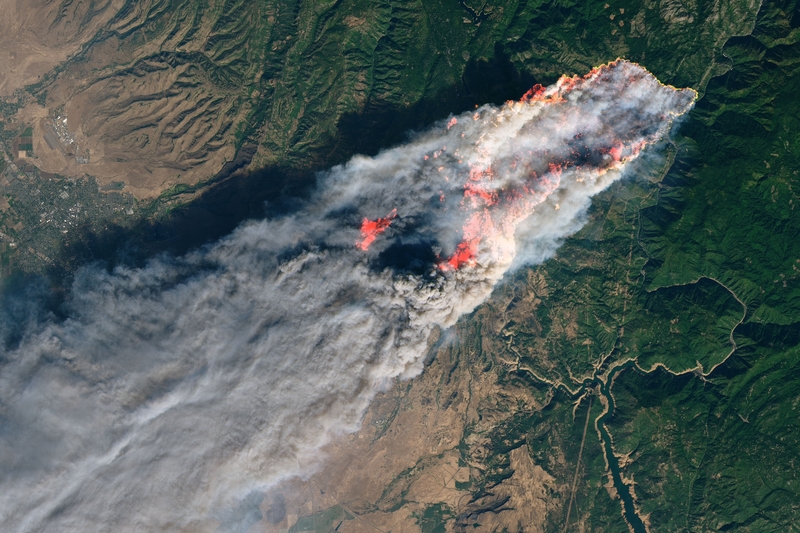 Burning is a traditional sovereign right, but in many places, including the U.S. and Australia, legal systems work to regulate fire out of the land. 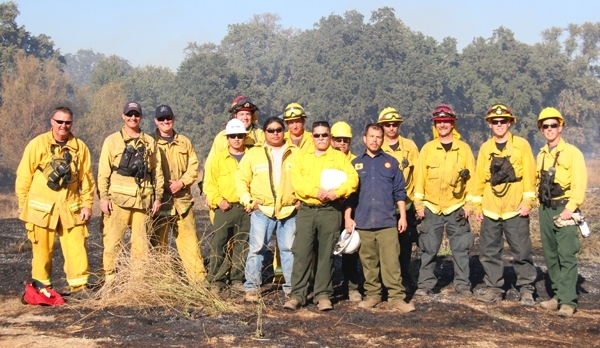 A culturally prescribed burn at the Cosumnes River Preserve to improve oak woodlands where Miwkoʔ traditional cultural practitioners worked alongside members of the Cosumnes Fire Department and Yocha Dehe Fire Department. Photo by Doug Bird. These kinds of challenges also exist with water. For example, my ancestral homelands of the Delta are now used as a major water conveyance, compromising ecosystems and Indigenous cultural properties. Despite our deep understanding of the area, Indigenous perspectives are really not considered in its management. I also think about what nature has provided in terms of water storage within the landscape and the fact that we still see interest in building dams rather than restoring natural basins and sinks. Luckily, some headway is being made in recognizing that natural landscape features contribute a great deal to recharge and storage. What about your work on fire and water in California do you find most challenging? I wish I had more time to devote to research, publications, and outreach. A lot of my current work is unfunded or has limited support, despite the applicability to current issues. Some projects have started out of me seeing a research need, starting a pilot project, and getting students or community members engaged to help out in the field. I really strive to be in the field because that's where I can do what I'm most interested in: applying Indigenous approaches to management and using scientific methods to assess the results. This work provides me opportunities to advance science, but also to keep a cultural lens on the landscape to assess the condition of, and changes to, traditional resources and interspecies relationships in the places I work. 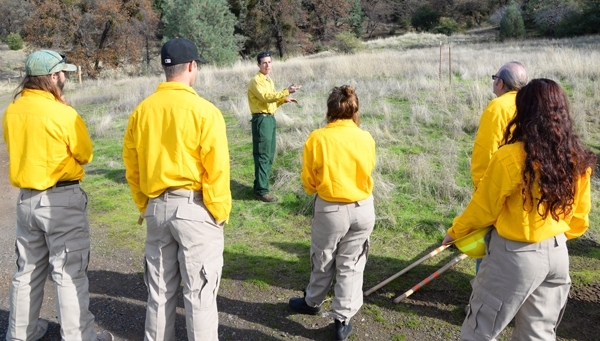 Hankins talks with students about fine fuels in advance of a meadow burn on the Big Chico Creek Ecological Reserve. Photo by Tyler Wright. Every day I see news about new research or political initiatives, and I feel overwhelmed. Getting word out, particularly to decision makers, is challenging, likely because they are overwhelmed too. We have a lot of misinformation on major decisions. I'm thinking of the Governor declaring a drought, or referencing year round fire as the “new normal.” If we teach people to read the land, they will know it is a drought, and when good fire can be used, instead of being vulnerable to what nature will provide otherwise. If we are to succeed in living in this land, we must consider what it is telling us and not force unrealistic solutions on it. What do you see as some ways forward to better align Indigenous perspectives and current management efforts? 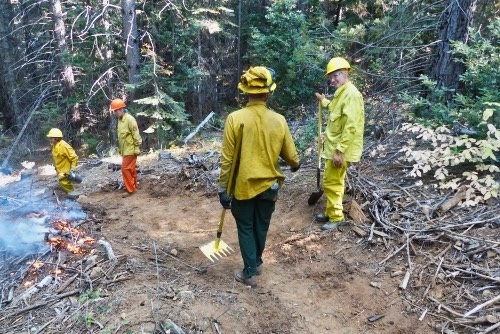 Vegetation sampling in a meadow the spring following a fall burn on the Big Chico Creek Ecological Reserve. One way is to embrace traditional Indigenous law, which is rooted in nature and holds individuals accountable for their actions in a reciprocal relationship with environment. Realigning existing policies and management could work to create more resilient systems. This also means forming partnerships with Tribes to guide the process, as well as with public and private entities to support it. It's a potentially exciting time to improve policy and management decisions for the betterment of conditions for future generations. I see a combined approach using traditional knowledge and science as being the solution to sustainable living and a resilient future. Really, that has been proven by the existence of the landscape that non-Indigenous people found when they arrived in California. We just need to facilitate a change in this society to see the benefits. To see dwarf mistletoe seeds is to experience them. These are not typical seeds that gently drop from a mature plant. Rather, they are explosive — forcibly ejected from their fruits at high rates of speed. I remember learning about this in college: that dwarf mistletoe seeds can travel up to 60 mph and fly more than 60 feet from their hosts (Hinds et al., 1963). 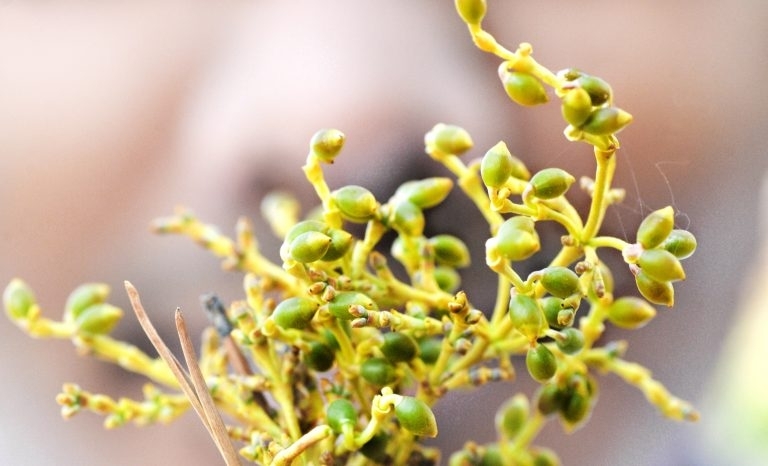 This process is triggered by internal heat production (called thermogenesis) within the mistletoe fruit — something that's never been observed in another plant (Rolena et al., 2015). It wasn't until many years after college that I actually experienced the phenomenon for myself. I remember driving along the Trinity River here in northern California and seeing a sudden splattering of little gelatinous green balls all over my windshield. I still remember how excited I was when I realized what they were: seeds that had flown as fast as I was driving. Dwarf mistletoe fruits. Credit: Thompson Rivers University shared via Flickr Creative Commons. It turns out that the seeds are only one of many intriguing things about mistletoe. There are more than 1,300 species of mistletoe; they grow all over the world (on all continents except Antarctica! ); they support and interact with wildlife in all kinds of neat ways (Watson, 2001); and they are part of human culture and tradition (even evoking a kissing response in some!). And yet they're parasitic — not usually our favorite type of organism. More specifically, they're hemi-parasitic, meaning that they obtain all of their water and minerals from their host plant, but have some ability to provide for themselves. For example, leafy mistletoe, which is common in oaks where I live, is fully photosynthetic and therefore has a limited impact on its host trees. Dwarf mistletoe is a more demanding guest, requiring water, minerals and other nutrients, and taking a much greater toll on the many species of plants that it inhabits. 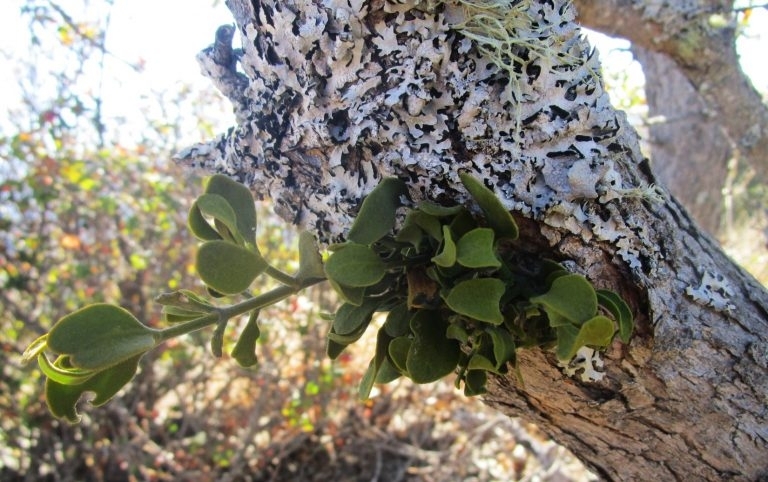 Leafy mistletoe is fully photosynthetic and therefore has a limited impact on its host trees. Credit: Dan Kidwell shared via Flickr Creative Commons. Like most forest pests and diseases, the relationship between fire and dwarf mistletoe is a two-way street: mistletoe affects fire, and fire affects mistletoe. For example, research has shown that mistletoe-infested stands of ponderosa pine have higher snag densities and higher fuel loads than uninfested stands, and that infested stands have higher crown fire potential (Hoffman et al., 2007). Mistletoe also has a number of tree-level effects that increase flammability and fire behavior potential, including the establishment of witches' brooms (dense, twiggy growth around areas of infection) and resinous stem cankers (Alexander and Hawksworth, 1975). Other research has documented reduced self-pruning and stunted growth in infected trees, both of which effectively lower the height of the live crown and thereby increase the potential for torching and canopy fire (Conklin and Geils, 2008). The effects of mistletoe on fire behavior are fairly intuitive, but I find the effects of fire on mistletoe to be a little more intriguing. For instance, a study by Zimmerman and Laven tested the effect of smoke on the seed germination of three species of dwarf mistletoe, and they found that smoke exposure can reduce germination or prevent it altogether (when exposure exceeds 60 minutes) (1987). Earlier work by Koonce and Roth had also indicated that heat and smoke might have a disproportionate effect on dwarf mistletoe compared with their effects on the host plant (1980). Other studies have looked at the sanitizing effect that fire can have on mistletoe-infected trees. Conklin and Geils studied ponderosa pine stands in New Mexico, and they observed reductions in the dwarf mistletoe rating (DMR) — a categorical system for assessing infection (Hawksworth, 1977) — in 12 of 14 frequently burned plots (2008). This sanitizing effect was associated with average tree scorch above 25 percent, and it points to the potential utility of prescribed fire for dwarf mistletoe management, assuming that fire intensity is able to meet these minimum “scorch pruning” thresholds. Hessburg et al. also found that thinning and burning could be effective treatments for dwarf mistletoe in ponderosa and Douglas-fir forests, but that treatments would have to be implemented on regular intervals, as effects diminished after 20 years (2008). Foresters using prescribed fire to treat mistletoe infestations in the 1970s. Credit: U.S. Department of Agriculture shared via Flickr Creative Commons. Of course, the relationship between fire and mistletoe — and the approach to fire-based treatments — is highly dependent on the fire regime of the specific forest type in question. Much of the literature on dwarf mistletoe and fire comes out of frequent-fire forests like ponderosa pine and western mixed conifer, but lodgepole pine and black spruce are also common hosts, and their fire regimes are much different. 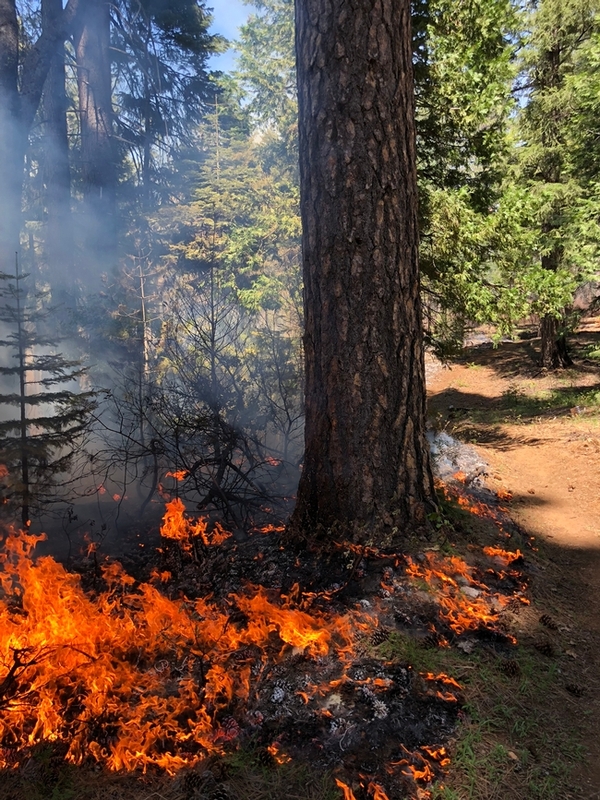 In those types of forests, which are adapted to less frequent, more severe fire regimes, stand-replacing fire may be important for protecting future cohorts of trees from infection. 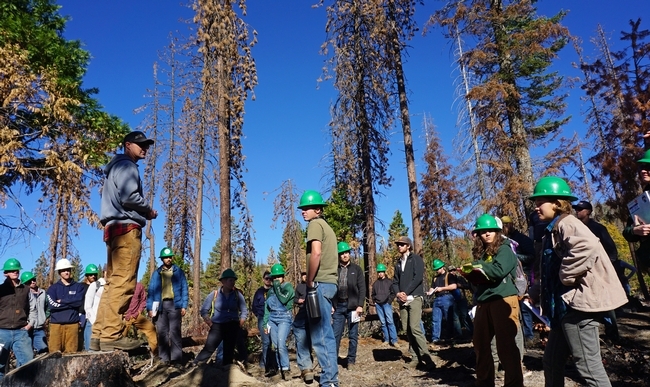 Research in Rocky Mountain lodgepole pine forests showed that the time elapsed since the last stand-replacing fire was a good predictor of mistletoe infestation, and that the presence of remnant infected trees increased rates of infestation in younger, post-fire stands (Kipfmueller and Baker, 1998). 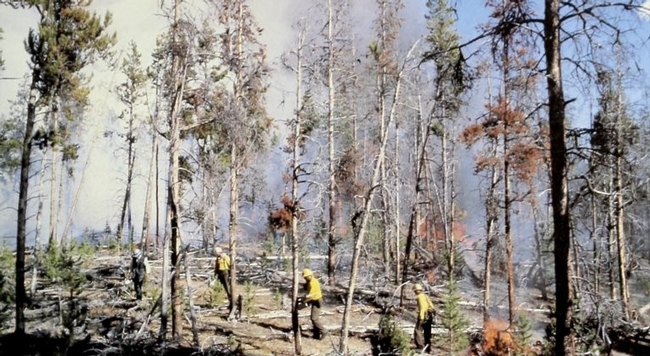 In these forest types, the authors suggest that effective prescribed fire treatments would need to be intense and stand replacing. I've always thought that mistletoe was interesting, but working on this blog opened a whole can of unexpected worms. Who knew that it was mistletoe, with its many interesting wildlife synergies, that inspired Charles Darwin to study evolution (Watson 2001)? Or that the term “mistletoe” is an ancient reference to some mistletoe species' reliance on seed dispersal by birds, who eat the seeds then deposit them on tree branches — the name comes from “misteltan,” an Anglo-Saxon word meaning “dung twig” (!!). Mistletoe has also been used by humans to bait deer for hunting (the foliage is quite tasty! ); to treat infertility, syphilis, bubonic plague, epilepsy and other ailments; and to celebrate the return of summer, which mistletoe hints at with its evergreen foliage (Paine and Harrison, 1992). So with this blog, I celebrate mistletoe — i.e., dung twig, kissing plant, ballistic seeder, fire friend and foe — as quite possibly the coolest plant ever! The Fire Adapted Communities Learning Network publishes blogs on a weekly basis. Subscribe to have more stories like this delivered to your inbox. Alexander, M. E., & Hawksworth, F. G. (1975). Wildland fires and dwarf mistletoes: a literature review of ecology and prescribed burning (Vol. 14). Rocky Mountain Forest and Range Experiment Station, Forest Service, US Department of Agriculture. Hawksworth, F. G. (1977). The 6-class dwarf mistletoe rating system. The 6-class dwarf mistletoe rating system., (RM-48). Hinds, T., Hawksworth, F. & McGinnies, W. Seed discharge in Arceuthobium: a photographic study. Science 140, 1236–1238 (1963). Hoffman, C., Mathiasen, R., & Sieg, C. H. Dwarf mistletoe effects on fuel loadings in ponderosa pine forests in northern Arizona. Canadian Journal of Forest Research, 37, 662-670. Kipfmueller, K. F., & Baker, W. L. (1998). Fires and dwarf mistletoe in a Rocky Mountain lodgepole pine ecosystem. Forest ecology and management, 108(1-2), 77-84. Koonce, A. L., & Roth, L. F. (1980, April). The effects of prescribed burning on dwarf mistletoe in ponderosa pine. In Proceedings of the Sixth Conference on Fire and Forest Meteorology, Seattle, Wash (pp. 22-24). Paine, L. K., & Harrison, H. C. (1992). Mistletoe: its role in horticulture and human life. HortTechnology, 2(3), 324-330. Rolena, A. J., Paetkau, M., Ross, K. A., Godfrey, D. V., & Friedman, C. R. (2015). Thermogenesis-triggered seed dispersal in dwarf mistletoe. Nature communications, 6, 6262. Shea, K. R., & Howard, B. (1969). 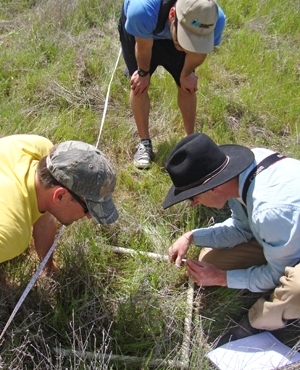 Dwarf mistletoe control; a program for research and development in the West. West Forest Conserv Assoc West Reforest Coord Comm Proc. Watson, D. M. (2001). Mistletoe—a keystone resource in forests and woodlands worldwide. Annual Review of Ecology and Systematics, 32(1), 219-249. Zimmerman, G. T., & Laven, R. D. (1987). Effects of forest fuel smoke on dwarf mistletoe seed germination. The Great Basin Naturalist, 652-659. 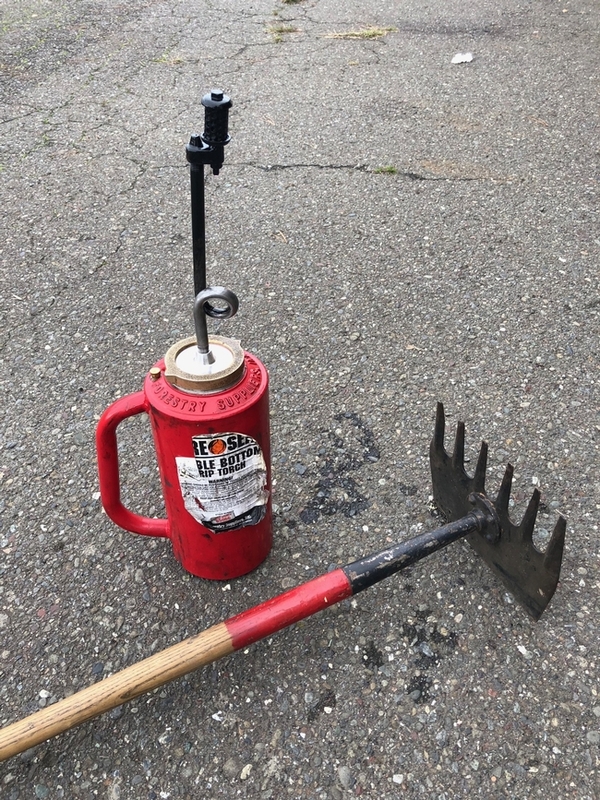 For many years, we at the University of California Cooperative Extension (UCCE) have fielded questions from landowners about using fire as a tool. Ranchers and forestland owners in Humboldt County have voiced interest in using fire to improve range resources, enhance wildlife habitat, reduce fuels, and beat back the trees and shrubs that are quickly engulfing their prairies and woodlands, but we have struggled to provide them with good options. In recent history, CAL FIRE led the majority of burns on private lands in California. In the 1980s, their Vegetation Management Program (VMP) was responsible for 30,000–65,000 acres of controlled burning every year. In recent decades, however, those numbers have consistently fallen short of 10,000 acres a year — a drop in the bucket given the habitat and fuels issues that we face in California. 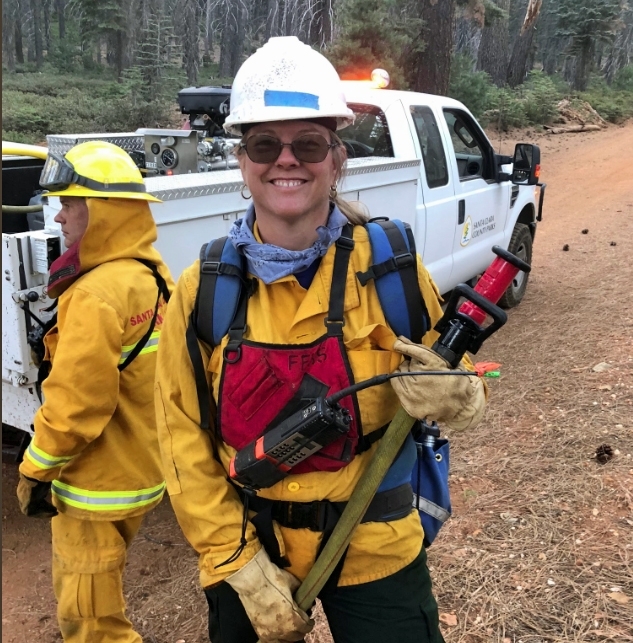 CAL FIRE is currently revamping and reinvesting in the VMP, which is great news, but it's clear that other pathways are needed for landowners to reclaim fire as the important tool that it is. Last year, UCCE started looking into prescribed fire models from other parts of the country. We know that other regions have impressive burn programs that blow California out of the water, and in most of those places, they've been successful because landowners are doing the burning themselves — something that's almost unheard of in California. 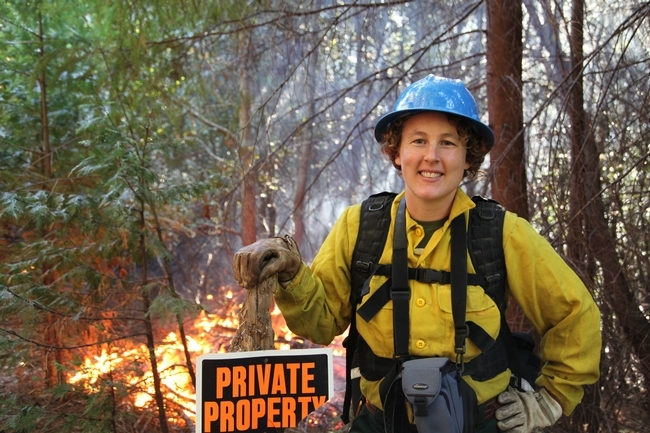 Over the last year, we worked with private landowners in Humboldt County to plan and implement burns. In June, we burned a 19-acre grass unit on a ranch in eastern Humboldt County, treating a patch of invasive medusahead. This Halloween, we burned 140 acres of coastal rangeland invaded by shrubs and trees. For both of these burns, we hired a qualified burn boss to write the burn plan and direct the burn, but we staffed the burns entirely with volunteers, including volunteer fire department members, landowners, and other interested community members. This model of burning — where the landowners take the lead — is truly an exciting and novel development in California, and I believe it is the critical ingredient to burning at a meaningful scale.